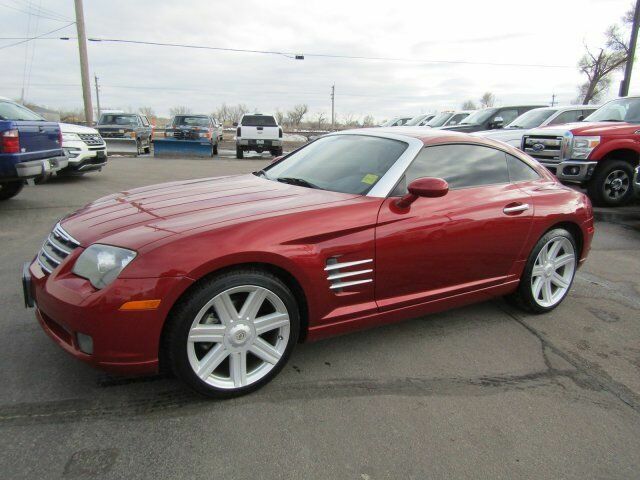 Check out this 2004 Chrysler Crossfire . Its transmission and Gas V6 3.2L/195.2 engine will keep you going. This Chrysler Crossfire comes equipped with these options: Visor vanity mirrors w/cover, Universal garage door opener, Traction control, Tow hooks & grille inserts, Tire service kit, Tire pressure monitoring display, Tinted windows, Speed control, Soft door trim panel w/map pockets, and Sentry Key theft deterrent system. See it for yourself at Wolf Auto Center Ogallala, 602 West 1st Street, Ogallala, NE 69153. All pricing and details are believed to be accurate, but we do not warrant or guarantee such accuracy. WAC. The prices shown above, may vary from region to region, as will incentives, and are subject to change. Vehicle information is based off standard equipment and may vary from vehicle to vehicle. Call or email for complete vehicle specific information.